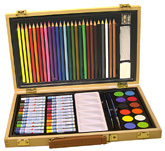 ON THESE AWESOME ART SETS & KIDS ACTIVITY KITS !!! to the joy of painting, sketching or making fun things. MINIMUM MERCHANDISE ORDER IS $19.00.